Our boutique vineyard estate specialises in hand tended grapes — Riesling, Gewürztraminer and Pinot Noir. They are hand harvested and produce a select range of artisan, premium wines as Single Vineyard Release wines (SVR). In 2015 we extended our range to Pinot Gris, grown locally on the South bank of the Waipara River. 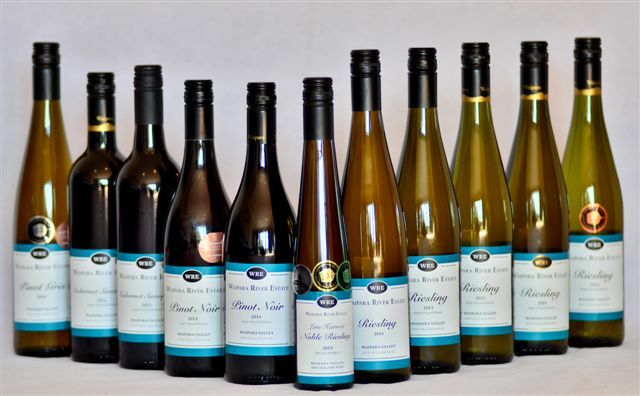 Our wines are made by superb Waipara winemakers Kym Rayner and Theo Coles The wines are specifically crafted in elegant, textural, classical styles as approachable, enjoyable wines to suit all tastes and as an excellent compliment for many cuisines. Pinot Noir grapes are juiced with skins on and fermented in French oak barrels for at least a year. Riesling, Pinot Gris and Gewürztraminer are fermented as juice in stainless steel tanks. We do not generally release our wines for two years after vintage to ensure they have properly matured. Once bottled they continue to mature and gain complexity. Drink now or cellar for several years. Handcrafted from our own estate grown grapes that have produced over 30 medal winning wines. “It is elegantly fragrant on the nose displaying lemon curd, backed apple and floral notes, leading to a finely textured palate that is delicately textured with crisp acidity. Beautifully poised with some bottle matured complexity, finishing long and refined.” Sam Kim. Wine Orbit. Handcrafted from our own estate grown grapes that have produced over 30 medal winning wines, this classic medium dry Riesling has a fine balance of aromatic, fruit flavours and a crisp finish. With residual sweetness and fresh flavours, drink now or cellar for 3–5 years. Machine Harvested April 2012, Brix 24.7 (sugars). 12% Alc./vol. ; Acid 8.6 gm/L (as tartaric); Residual Sugar 20gm/L, pH3.3. Winemaker: Kym Rayner. “An immediately appealing riesling; the fragrant bouquet shows mandarin, apple and lemon peel with subtle flinty notes. It is juicy and expressive on the palate, beautifully enhanced by subtle sweetness and perfectly pitched acidity. Flavoursome and lingering.” Sam Kim, Wine Orbit. Hand Harvested May 2013, Brix 22 (sugars). 12% Alc./vol. pH 3.34, TA 8.1. Winemaker: Theo Coles. Handcrafted from our own estate grown grapes & selected Waipara grapes that have produced over 30 medal winning wines, this classic medium dry Riesling has a fine balance of aromatic, fruit flavours and a crisp finish. With residual sweetness and fresh flavours, drink now or cellar for 3–5 years. Hand Harvested May 2014, Brix 22 (sugars). 12% Alc./vol. pH 3.34, TA 8.1. Hot Waipara summers enable our 30 year old vines on their own roots to ripen fully and produce an elegant classic style wine in a deep, rich, dark, black-hued red colour with a ruby edge. Plum, blackcurrant and chocolate flavours will develop complexity and intensity over time. The wine is medium-bodied, with fine-grained tannins in the background and a soft texture.